Situated in the heart of Dingwall, a Highland town 14 miles North of Inverness. 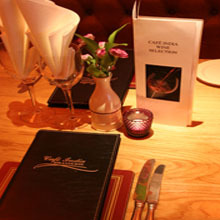 Cafe India has encompassed the authentic taste of India for nearly 15 years. Their menus offer a wide range of succulent and spicy Tandoori food, from the wild North West frontier in the shade of the icy Himalayas, to the Goa Fish Cutlet from the exotic sun drenched, lotus land of the South.